Kids month concludes with yet another Disney gem later remade with Lindsay Lohan. Once again (though not surprisingly), I prefer the original. Freaky Friday (DVD/Download) started out a fantastic novel that I stumbled onto in the public library as a child, and happily the movie adaptation does not disappoint. Starring Jodie Foster and Barbara Harris as a mother and daughter who switch bodies for the day, this film is a wonderful 1970’s time capsule full of bad special effects, bell bottom pants, and synchronized water skiing. It’s shocking that Jodie Foster made Freaky Friday the same year as Taxi Driver, because the roles couldn’t be more different. Field hockey playing tomboy Annabelle Andrews is a far cry from child prostitute Iris, and it just illustrates the talent she had at such a young age. The one thing I always related to was Annabelle’s preference for junk food. Banana splits for breakfast? Sign me up! As an adult she switches to cold macaroni and cheese- another stellar choice. I never wanted to switch places with my working mother, but had she been a housewife like the elder Mrs. Andrews, I might have been tempted. Sure laundry and grocery shopping are drags, but it’s not like those have to be done every day. There would have been plenty of time left over for soap operas and raw cookie dough binges. One thing about Mrs. Andrews that I can relate to is the pressure of throwing a dinner party. If I were cooking, I’m pretty sure limp parsley and burnt turkey would end up on my menu too. But dang that chocolate mousse looks good, even on the walls. 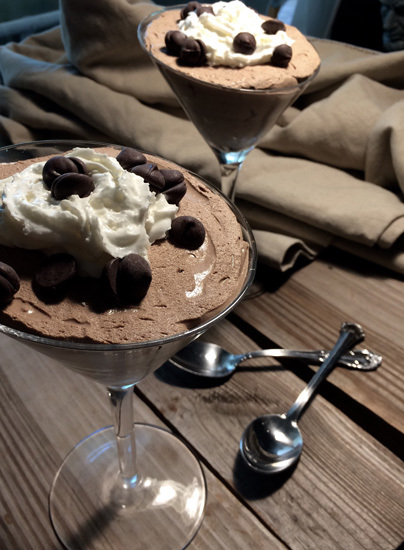 Therefore this week, while watching Freaky Friday, I recommend making a Grown-Up Chocolate Mousse. Combine mousse mix, milk, Amaretto, and Baileys in a bowl. Beat on high with electric mixer for 3-5 minutes, or until thickened. Refrigerate for at least an hour, then top with whipped cream and chocolate chips. Although this dessert isn’t technically a cocktail, it’s got booze and lots of chocolate. Teenage me AND adult me thoroughly approves. Would I ever want to switch places with another person I know? No, probably not. However every morning when I look longingly at my napping dog and head out to the office, the thought does cross my mind. But then I think of Freaky Friday and remember- nobody wants to eat kibble. Not even on a smorgasbord. Cheers! Posted in Children's, Classic Films and tagged Amaretto Mousse, Barbara Harris, Boozy chocolate mousse, Freaky Friday, Jodie Foster, movie cocktails, vintage Disney. Bookmark the permalink.